POSITIVO ESPRESSO: 2015 -- Ended with an Exclamation Point! 2015 was for me a year of dramatic change. So I was elated that I managed to complete the major cycling goals I set at the outset for the year, taking advantage of a nice, lengthy planned professional transition to complete both an "SR600" and Paris-Brest-Paris, while also participating in two very different, spectacular weeklong events--the Giro del Dolomiti and Cycle Oregon. 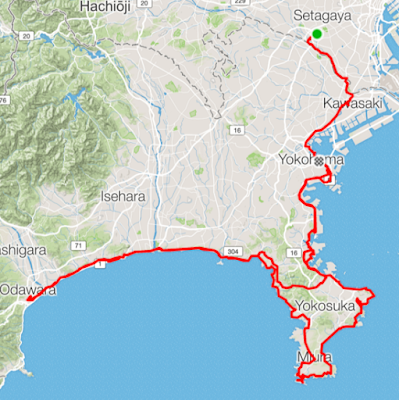 According to my mileage log, I rode over 15,300 kilometers in 2015. Despite all these highlights, this autumn I have been on the other end of the professional transition and very busy on all fronts. I have only taken a handful of "classic" weekend rides with friends in the hills west of Tokyo. No randonneuring. Indeed, October and November were my two lowest mileage months since January, despite regular Wednesday 75+ km commutes to the Keio SFC campus. For the last goal this year, I looked forward to the annual Strava/Rapha "Festive 500" -- ride 500 kms recorded by GPS and uploaded to the Strava site, and get sent a small cloth patch in the mail months later. This trivial award is much better than other Strava challenges, which seem to offer mostly an "opportunity" to buy exclusive Strava-branded goods. 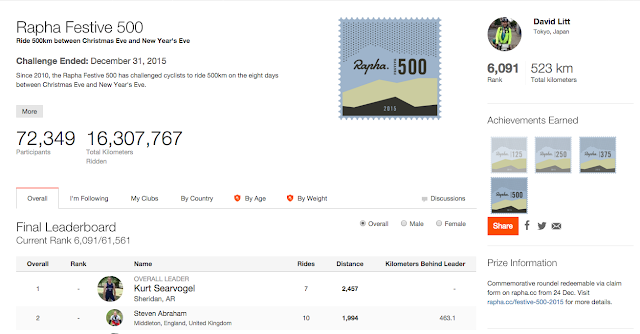 I've managed to complete the Festive 500 the last two years, but as of December 30, with only a day left, the situation looked bleak for this year. I took a short Christmas ride on the 25th, but had other plans the 26th and 27th. On the 28th, I rode out of town in the morning and into town on a commute for an afternoon at the office and evening dinner, but only 90 kms. Worse, I ate something that disagreed with me, and was so weak by the evening that I needed to lock my bike half way home and hop in a taxi. On the 29th, I had planned to ride with my two sons, but one was not feeling well, so instead we substituted a much less strenuous plan than a bike ride. On the 30th, other plans. So with one day left on the Festive 500 calendar, I had ridden only around 220-230 kms out of 500. 270-280 kms remaining. (There is some uncertainty because I had not realized Strava does not "count" a ride that is marked private -- which I had done for a few shorter local trips I was recording but did not think merited going into the Strava feed.) I was considering a click on the "leave challenge" link. Then again, what is 280 kms? Less than Tokyo-Itoigawa. Less than a 300 km brevet. And riding for a Strava challenge, I could have complete freedom as to my course. I could even change course mid-ride based on conditions -- come to a long red light? Turn at the corner and head up the cross street, then cross it at the next signal and come back down the other side, turning again and continuing en route. Do it all at a relaxed pace, and add 500-750 meters for what otherwise would have been sitting at a signal. So after a look at a forecast for beautiful weather and only light winds December 31, I decided to go for it. And did it -- leaving home shortly after 6AM. 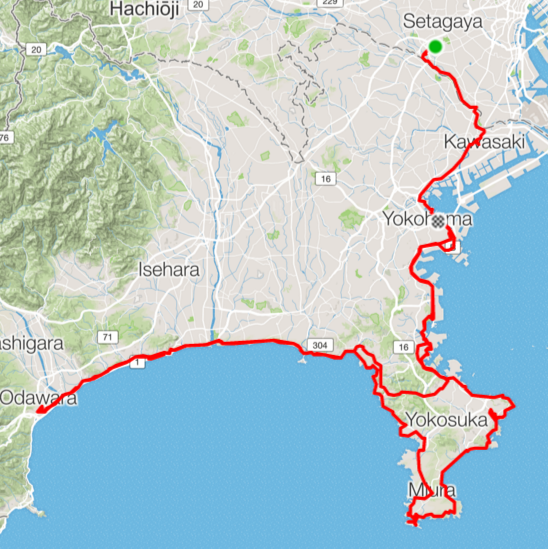 I rode a classic winter course around the Miura Peninsula and the Shonan coastline to Odawara, and back again, and had a very nice time. Through Minato-Mirai section of Yokohama. No traffic around 7AM on December 31. At Hakkeijima on the southern tip of Yokohama. Lost more fishing boats up ahead. Cats at the park on Jogashima -- residents, not visitors. The final food stop was a convenience store again, when I was almost back to Yokosuka on the return. I hopped the train at Motomachi/Chuka-gai station around 7PM. Not bad for a 265km+ km ride. Great conditions, ... almost no one driving, except for the LONG lines of cars at service stations as Japanese get a car wash and fill up the gas tank in preparation for the New Year. I rode the Sky Blue Parlee with my Gokiso wheels -- the Parlee is a joy to ride -- and the 50mm carbon rimmed Gokisos take the minimum of effort to maintain a reasonably high speed. For some reason, the hills of Miura looked much more gradual than I had remembered from the past. And indeed, Strava tells me I rode "personal best" efforts on many, many of their segments over the ride. Anyway, it was a good ride to end the year and complete the "challenge". I am delighted to be in the same event, of a sort, as Kurt Searvogel and Steve Abraham, this year's two leading HAMR participants ... even if they were #1 and #2, while I was #6091 out of 72,349 participants. As for 2016 ... stay tuned. Plenty of epic rides in mind. Well done on this final ride for the year, and completing yet another challenge, albeit a moderate one by your standards. Looking forward to hearing about more epic - but safe! - rides in 2016. Yes. Well done. You are so motivated.